Leading UK mobile agency; Cymba deliver technical mobile marketing and messaging solutions used by many big name brands and charities. Our mobile innovations are client driven and our service values reflect our many years of understanding. Since 2004 - we now support over 100 lead marketing and media agencies and over 60% of the UK’s best loved charities. We are London based. 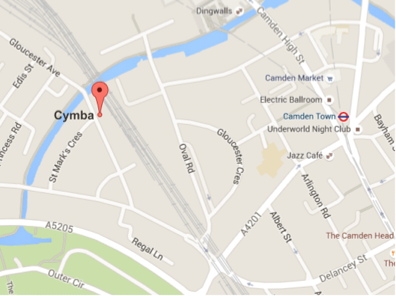 We’re based in Camden. We are experts in mobile response, systems integration, delivering loyalty programmes and incentive driven mobile promotions. "....The Cymba team bent over backwards to get us our short code quickly, which worked flawlessly, and they provided an amazing tool to curate the texts. And on top of that, it was a delight to work with them." - Senior Director of Digital Marketing and CRM, Hard Rock International. We take pride in building your bright ideas and bringing them to life. Customers include Coca-Cola, Disney and Vodafone. Charities are putting mobile response in the forefront of new acquisition and regular giving. Our integrated multi-channel approach includes print media, face-to-face fundraising, social media, contact centre and mobile web (applications). We work with all major UK fundraising agencies. We understand how mobile response metrics work; from data and income perspective. Customers include UNICEF, WWF, WSPA, St John Ambulance, RSPCA, NSPCC, Barnardos and Save the Children.